Solid silver very ornate ends and rounded middle section in perfect condition.London 1901 with makers Thomas Bradbury.Size 3" x 1"
Solid silver arched ends with straight and upturned ended middle section in perfect condition. Birmingham 1905-06 made by Elkington & Co.Size 3.5" long x 1.25" high. Solid silver with fancy ends and ornate middle section in perfect condition. London 1812 from George 3rd. period. Size 2.5" long x 1" high. The makers mark has been rubbed out. Solid silver with flattened ends and fluted middle section in perfect condition. Makers William Gibson and Jonathan Longman London 1897. Solid silver with flat ends with a central circle and very ornate centre sectiopn made by George W. Adams London 1850 in perfect condition. Quite heavy pair of solid silver rests dated 1898 made by William Hutton and Sons Ltd. who were large Sheffield manufaturers. Hallmarked in London with clear marks throughout and a bevelled and circular engraved centre stem. 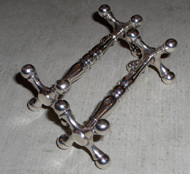 A good pair of German silver patent 90 Knife Rests from the Art Deco period circa 1933. Size 4.5 inches long x 1 inch high. A very unusual pair of French Art Deco Rests one depicting apples the other strawberries. Made in Nickel Silver they are in extremely good condition. Sizes 3.5" (87.5 mm) long x 1.25" (32mm) high. An individual Knife Rest with a date of 1813-14 assayed in England and made by William Sumner. This rest is in extremely good condition and is as original. Size 2.5" (62mm) long x 1.25" (31mm) high. A superb pair of foreign silver (unmarked) carver rests with teardrop piercing and "shell" ends to the stylish bases. Probably French dating from circa 1890 in pristine condition. sizes 2.5" (6.5cm)wide x 1" (2.5cm) high.